The current Board of Directors (Board) of Transnet SOC Ltd was appointed on 24 May 2018, approximately two months after the end of the year under review. Its appointment coincided with the new epoch defined by the President of the Republic of South Africa as the “New Dawn”. The New Dawn is characterised by a resolute determination to rid public institutions of all malfeasance, which set in over the past nine years of our democracy, accompanied by their systemic destruction or weakening. Our task now is to rebuild our public institutions, restore the loss of their integrity and to refocus them on their mandates. For the Board of Transnet, the strategic challenge flowing from the aforegoing vision relates directly to the biggest logistics, transport and infrastructure company of the State of which the strategic mandate is to drive socio-economic development. The outcomes of its successful discharge of this task must be the stimulation of economic growth, growth of other businesses, especially small and medium-sized ones, increased jobs and the reduction of poverty and inequalities. The Board considers itself privileged to have been appointed to the stewardship of the largest logistics, transport and infrastructure company of the people of South Africa. The Directors, without exception, appreciate the depth of dedication required of them, together with the management collective and the more than 50 000 Transnet employees. We also acknowledge the concomitant collaboration with our customers and service providers that is necessary to drive the economic growth and sustainable development of Transnet’s human capital, and that of society at large. Our first days in office coincided with sustained negative media coverage of the Company’s business dealings. At the same time, the preparation of Transnet’s 2017/18 Integrated Report and Financial Statements were near completion. According to King IV, the annual Integrated Report represents the voice of the governing body. As Directors, we owe our duties to the legal entity that is Transnet SOC Ltd. 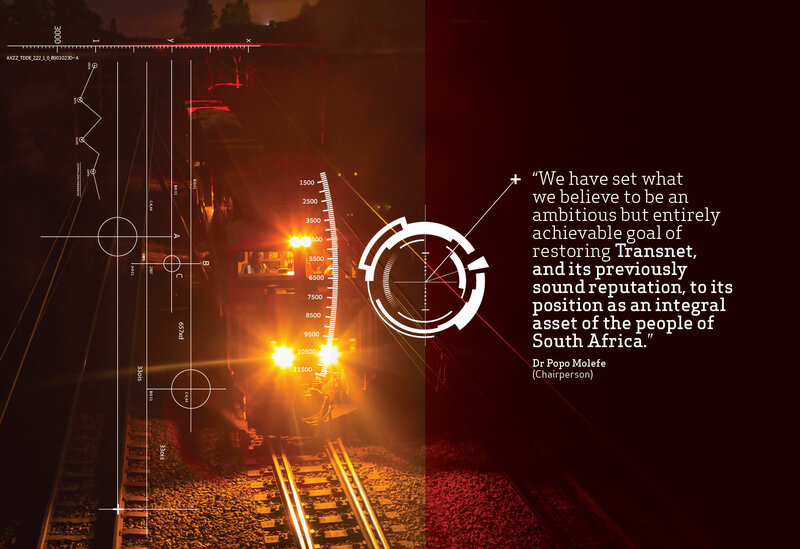 In acknowledging the diverse interests representing the Company, which include the interests of our Shareholder, our employees, customers and communities, we are duty-bound to act in good faith, not only in signing off on the year’s performance but also in setting the direction and tone for Transnet’s strategic aspirations going forward. Given the brief period available to us to examine, approve and sign off the Transnet 2018 integrated reporting suite, we have relied heavily on the work done by Management and attempted to interrogate and provide our own observations where we could. Engaged certain forensic specialists to review the reports prepared relating to the much-talked about 1 064 locomotives contract, where Transnet has been accused of mismanaging the supply-chain management process resulting in associated costs increasing from approximately R38 billion to R54 billion. Formulated the key governance sub-committees of the Board. Abolished the ‘Acquisitions and Disposals’ (ADC) sub-committee, as we do not believe the Board should be directly involved in procurement processes. Commenced interactions with key state institutions charged with investigating “state capture”. Reviewed the progress of the investigations instituted by management, relating to payments made to companies identified in various media reports. The reporting period was further marked by a credit downgrade of Transnet’s foreign and local currency ratings, due to the rating action on the sovereign, as Transnet is viewed to be closely linked to the Government. The downgrades precipitated an increase in financing costs and a forced slowdown in capital expenditure, necessitating a need to supplement investments with capital raised through private- sector partnerships. The rating agencies have, however, noted significant growth potential for the country, even though they acknowledge that the new political administration will require time to improve economic growth, accelerate employment and stabilise the fiscal position, given the country’s structural weaknesses. Together with our fellow directors and Management, we have set what we believe to be an ambitious but entirely achievable goal of restoring the integrity and reputation of Transnet. As a Board, with appropriately diverse skill-sets and depth of commercial experience befitting the task, we intend to ride the coat-tails of our President, who, in December 2017 began to usher in a new era of greater cooperation between the Government, business, labour and civil society, and to foster greater inclusivity in South Africa’s policy environment, as evidenced by his success to date in his R1,2 trillion investment drive. His market-friendly approach and firm stance against corruption and maladministration is steadily building greater confidence among consumers, businesses and investors alike. In his words, “a restoration of confidence is the quickest and cheapest form of stimulus available, especially in light of our fiscal constraints”. This is true at the macro-economic level for our country, and at the micro-business level for Transnet. At the heart of the business is our obligation to assist in lowering the cost of doing business in South Africa, while ensuring security of supply by providing appropriate port, rail and pipeline infrastructure. As a SOC, Transnet must deliver on national developmental goals, as they pertain to the transport and logistics sector, ensuring that the country remains competitive on the continent and globally. In many respects, our country is a driving force for the growth and expansion of the African continent, with infrastructure to match any first-world country. This said, the World Bank and International Finance Corporation (IFC) rank South Africa in 39th place in the world for ease of doing business. Cost is of concern, particularly when trading across borders. The Company’s Transnet 4.0 strategy, formally set in motion during the 2018 financial year, is geared to accelerate efforts to extend the Company’s – and indeed South Africa’s – commercial footprint in the fast-growing regions of Africa, the Middle East and Asia (AMEA), by offering affordable rail, port and pipeline infrastructure support to our cross-border neighbours. This vision proudly aligns with the “Africa 2063” strategic framework for socio-economic transformation of the continent over the next 50 years into a uniquely African trade environment, which fosters growth and sustainable development for Africans, by Africans. The founding principles of the Transnet 4.0 strategy further echo a key tenet of the President’s 2018 Address, in that our prosperity as a nation depends on our ability to take full advantage of rapid technological change. The new Board is committed to transitioning the business to adapt to global industry 4.0 trends, particularly in the ambitious goal of transitioning from our current second-party logistics provider (2PL) status to becoming a third-party logistics provider (3PL) in the short to medium term, and ultimately striving for fourth-party logistics provider (4PL) status in the long term. 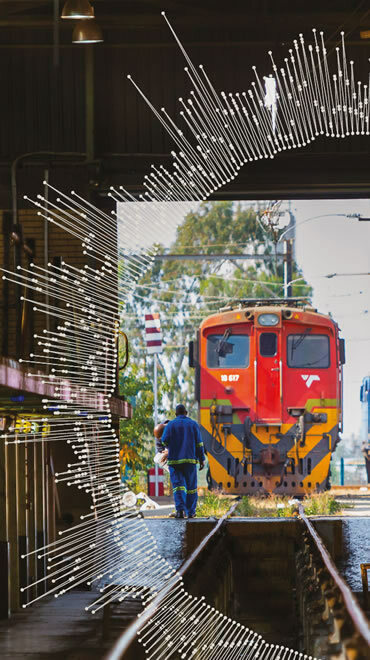 Ultimately, Transnet must progress with the times by becoming a digitally driven organisation, both from the perspective of driving efficiencies to lower business costs, and to innovate around new products and services. It is prudent that we first and foremost guard against the financial, operational and governance challenges that have in recent years both directly and indirectly impacted negatively on the overall performance of the economy and consequently placed pressure on the very fiscus we, as a SOC, serve to protect. As the Transnet Board, we are committed to improving coordination, oversight and sustainability of the business, by enhancing internal governance oversight and supporting the Auditor-General to strengthen external audit processes. In this way, we hope to help restore public trust in Transnet as a SOC, a national infrastructure provider, a progressive business partner, and a national employer of choice. We will also improve our engagements and interaction with various stakeholders, customers, service providers and emerging business. Notwithstanding the various governance challenges experienced in recent years, we are convinced that Transnet can be an extraordinary company that, given the opportunity, will grow and impact positively on the economy of our country. A valuable point of departure is to restate Transnet’s core mandate, particularly as it facilitates the broader economic and developmental goals of the country as articulated by President Cyril Ramaphosa in his 2018 State of the Nation Address (SONA); and to express our own understanding of and commitment to the mandate bestowed on us as the new Board in steering the Company towards its vision. The excellent financial performance appears clearly in the Annual Financial Statements and is further articulated in the Executive summary of the Group Chief Executive and Acting Chief Financial Officer. Regrettably, during the year five employees passed away in our operations. On behalf of the Board of Directors, we wish to express our heartfelt condolences to their families and all who were touched by their passing. The Company also lost a friend and mentor in Gideon Mahlalela, whose passing two days before year-end was sudden and unexpected. We further wish to convey our sympathies to the families of the 102 members of the public who lost their lives during the year in and around our operational activities. As the Board, we undertake to review the nature and causality of all fatalities and do our best to entrench Group-wide safety awareness. We wish to acknowledge the ongoing efforts by all Transnet employees. As the Board, we appreciate that the 2018 reporting year was harrowing, given the pervasive and sustained media reports on State Capture, which cast a cloud over many SOCs, Transnet included. As disheartened as many might feel at this time, we owe it to ourselves and our colleagues to remain strong and grounded. We also wish to thank the leadership of organised labour for their guidance, leadership and willingness to share in the Company’s long-term vision. Thank you to our customers and commercial partners for your support and confidence in our abilities amid difficult economic and operational conditions during the year. As the new Board, we look forward to learning more about our customer environment and to finding innovative ways to improve Transnet’s service offerings to you. Our sincere gratitude to the Minister of Public Enterprises, Mr Pravin Gordhan – who represents our Shareholder and the people of South Africa – for his confidence in our ability to deliver on our DPE mandate, for his encouragement, guidance and his belief in the leadership to take Transnet forward. On behalf of the Board of Directors, we pledge our unwavering support for his vision for our company. Our deep appreciation to our regulators, including ministries with which we work closely; as well as various committees in Parliament; provincial governments; and municipalities that contribute their oversight responsibilities and partnership commitments. To community partners across the country, we are privileged to serve as the custodians of South Africa’s largest infrastructure state-owned company. We look forward to partnering with you in our various enabling projects.